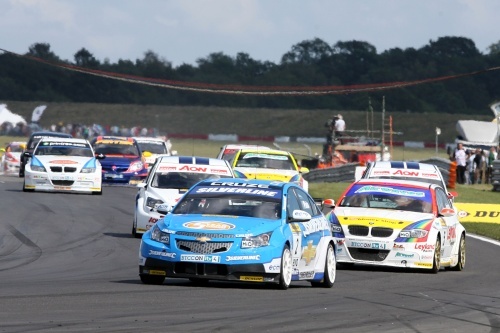 Jason Plato and Gordon Shedden were the winners of the weekend's three Dunlop MSA British Touring Car Championship races at the high-speed Snetterton circuit in Norfolk. Jason won both races one and two and with chief rival Matt Neal experiencing mixed fortunes it means the Chevrolet driver has turned an eight-point deficit into a 20-point lead over his Honda rival as the BTCC heads for its next round at the world-famous Silverstone circuit in Northamptonshire in a fortnight’s time (Sunday 22 August). Jason led both the day’s first two races from start to finish – despite his Silverline Chevrolet Cruze being laden with 36kgs of success ballast in race one and then the maximum 45kgs in race two. He also set the fastest lap in both to ensure he took a pair of maximum scores. Matt, meanwhile, retired from race one with a puncture and could only manage ninth in race two. In race three, Matt’s team-mate Gordon was gifted a clear run to victory when early leader James Nash’s Triple Eight Vauxhall Vectra span off the track. Matt took third to give the Honda Racing Team a 1-3 result with Jason backing up his two earlier wins with fifth. Gordon’s result, following fourth and eighth places in races one and two, keep him third in the overall standings and he has in fact closed to within just four points of Matt. Notably, Jason has reached 57 career wins in the BTCC and he is now just three shy of Andy Rouse’s all-time record of 60. Others to figure strongly today included BMW drivers, Airwaves’ Mat Jackson and WSR’s Robert Collard, who each took a second place, in races one and three respectively. Team Aon’s Tom Chilton also enjoyed three strong results with third, second and then fourth place finishes to move up to seventh in the table and to within sight of fourth-placed team-mate Tom Onslow-Cole. The latter came from 21st to sixth in race one following dramas in qualifying and was then third in race two. But in race three it all went wrong when he span off the track in a collision with Mat Jackson. As a result he has lost his lead in the Independent Drivers’ championship to Jackson’s team-mate Steven Kane. Today should have also brought some strong results for Plato’s 19-year-old team-mate Alex MacDowall who on Saturday had become the youngest driver in BTCC history to qualify on pole position. Cruelly, though, his car’s gearlever broke off the race one start line and he would fail to score in any of the three races. Elsewhere, the Honda Racing Team leaves Snetterton still ahead of Airwaves BMW at the top of the HiQ Teams Championship. Honda/Dynamics also continues to lead the Manufacturers/Constructors standings but only after Aon/Ford had nosed ahead briefly in today’s second race. It is also tremendously tight in the fight for Independent Team honours, with Airwaves BMW just five points clear of Team Aon.